Get is covered in sauce or in a bucket. 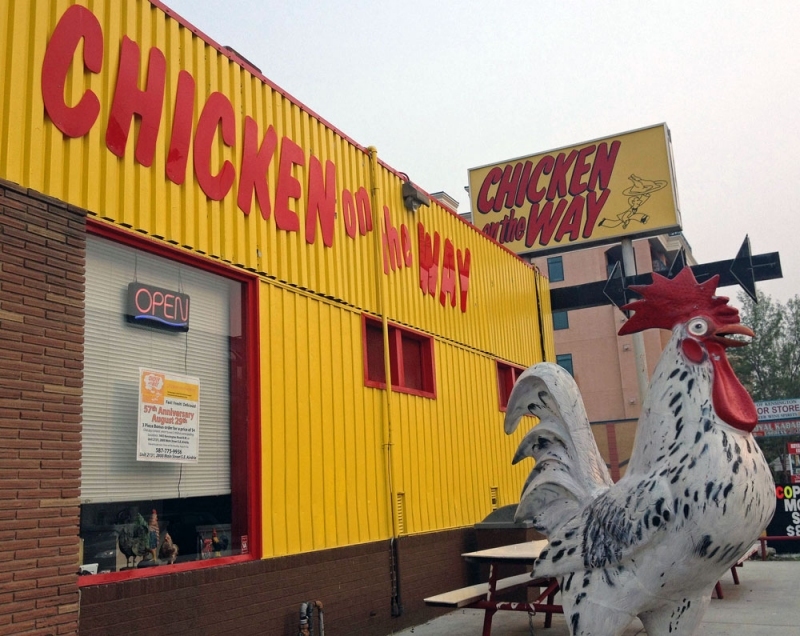 Chicken on the Way is a Calgary institution that celebrates its 59th anniversary this summer. It started with a few trucks that would drive to a delivery location, drop the chicken in the fryers in the back and serve it up with French fries and fritters. Now it has nine locations, including six in Calgary. Its Kensington location is open late if you have a post-partying hankering for hand-breaded and then fried wings, breasts, legs or thighs. Nicole Gomes showed the country her cooking chops when she won Top Chef Canada All-Stars, but what we have that the rest of the country doesn’t have is direct access to her fried chicken. Gomes and her sister Francine are the duo behind the takeout restaurant Cluck N Cleaver where you can get pieces, quarter, half and full chickens along with fries, salads and biscuits. Always get the biscuits. They’re the best. At Fritou, they use special fryers that give their chicken a thin crisp layer and lets them filter the oil several times a day. You can get between one to 40 pieces in your order with fries, gravy, coleslaw and macaroni on the side. Fritou also has popcorn chicken and wings. And, if you are feeling like you need a vegetable, it has a chicken Caesar salad. We recommend the especially delicious fried chicken club sandwich. This is where you go if you want to have your chicken with a few pints and maybe a game of Skeeball. 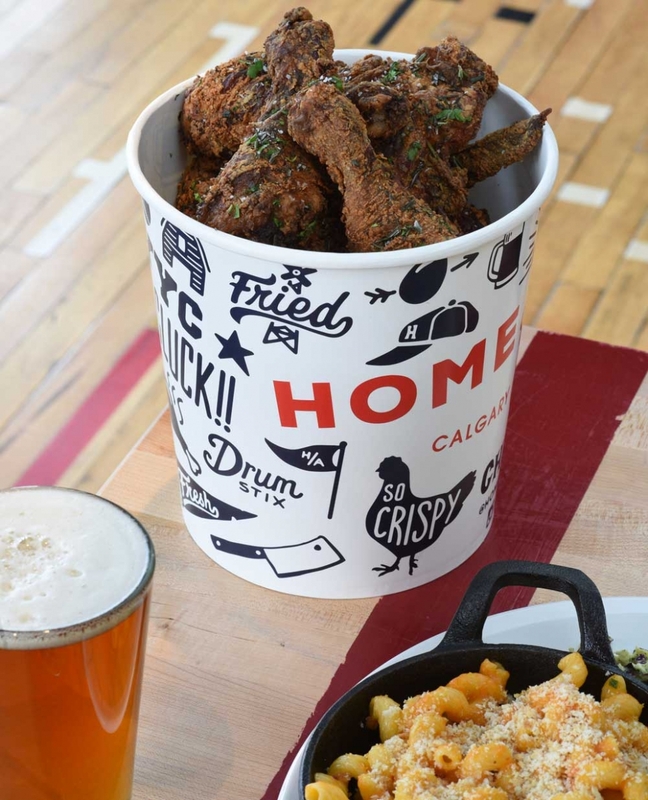 Home & Away sells its fried chicken in three-piece meals or 12-piece buckets. Alberta honey, hot sauce, slaw, pickles and mac and cheese round out the meals. Like other Korean fried chicken restaurants, the chicken here is light, crispy and slightly less greasy than your standard fried chicken. Creamy garlic, hot soy garlic and seasoned are all flavour options. If you are feeling fiery, get the fire bomb chicken with hot sauce. You can buy an individual meal or family-sized combos. The ultra crispy-crunchy Korean-style fried chicken is served here with a small dish of pickled radish on the side. It’s so good we put it on our annual best things to eat list – twice. At Olive and most other KFC (Korean Fried Chicken) joints, always opt for sauce when given the option between sauce or no sauce. The sweet and spicy condiment makes the chicken even better. Ordering here is made easy with just a few decisions to be made, including what type of pieces you want (thighs, wings, drumsticks, etc. ), how many pieces you want and if you want it original or seasoned. Add some sides, get a pitcher of beer and settle in to enjoy your chicken while K-pop plays on the big screen. Calgary now has its very own Nashville hot chicken food truck. The famous southern dish is spiced with cayenne pepper and often served with white bread. In Zilford’s case, you can get your chicken on a biscuit from Engel’s Bakery. Or, just get it straight-up with pickles and mac and cheese on the side.